Some women report that they did not experience any symptom for a few weeks. If you need free testing, you can search below or order affordable early detection pregnancy tests online from our corporate sponsor Fairhaven Health. If you would like to speak to someone about your symptoms or the possibility of being pregnant, you may call the APA toll-free helpline at 1-800-672-2296, or search locally by your zip code below. While implantation bleeding is often considered the first pregnancy symptom, the survey conducted by the American Pregnancy Association revealed that only 3% of women identified implantation bleeding as their first sign of pregnancy. If you are trying to get pregnant, get this eBook to find the quickest and easiest way to achieve conception. The eBook is available here: Essential Guide to Getting Pregnant. If you believe you are pregnant, you can get our Free American Pregnancy Association app: iOS (Android coming soon) to follow along with your pregnancy as well as many other pregnancy-related tools. Swollen or tender breasts: The third most frequently cited symptom of pregnancy is changes in the breasts. These changes are usually indicated by swelling or tenderness. Changes to the breasts can start as early as 1 to 2 weeks after conception. It is important to note that mood swings are normal; however, if you find yourself struggling with depression or extended periods of sadness, you should contact your healthcare provider. Some women prefer to go directly to a counselor or mental health professional. If you have been sexually active and are questioning whether you are pregnant or not, contact an APA Pregnancy Specialist on our chat or at 1-800-672-2296 to discuss your signs of pregnancy. You can also find free testing centers using the zip code search below. One of the most frustrating things for those questioning a potential pregnancy comes from the reality that many of the symptoms of pregnancy can be associated with a pending menstruation or tension or stress. If you have been sexually active and trying to determine if you are pregnant, contact our pregnancy helpline daily at 1-800-672-2296. You may also use your zip code below to find a free pregnancy testing center. This can last throughout your entire pregnancy. Some women develop aversions to certain types of food as well, and this too can last throughout your pregnancy. If you are trying to get pregnant and looking for resources to support your efforts, we invite you to check out the fertility product and resource guide provided by our corporate sponsor. Review resource guides here. Get our Free American Pregnancy Association app: iOS Android to follow along with your pregnancy as well as many other pregnancy-related tools. Having symptoms? Call our toll-free helpline at 1-800-672-2296. Questions about paternity? Call for free paternity info at 1-800-798-0580. 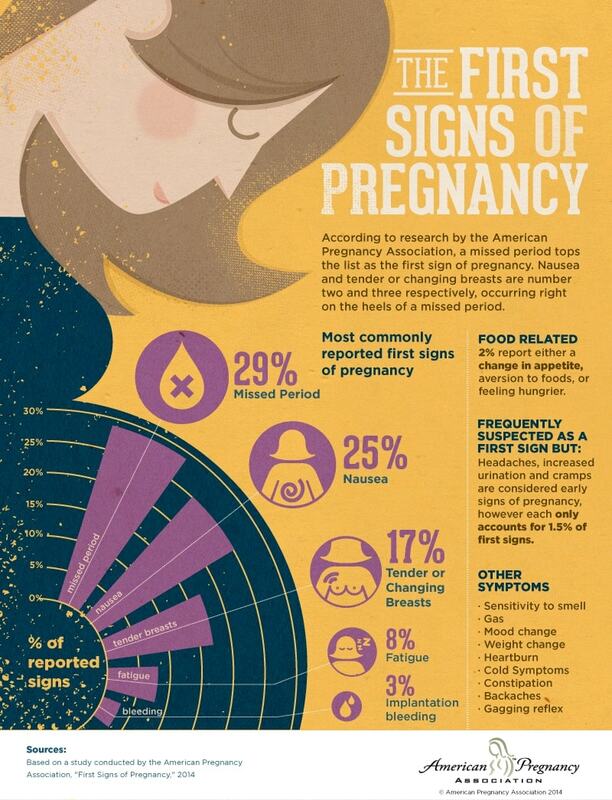 Check out, share and download our infographic below on the top pregnancy symptoms and early pregnancy signs!